For nearly three years, the plan was one of the best-kept secrets in Jacksonville. ¶ While the leadership team at the Museum of Science and History has had some 250 people weigh in on parts MOSH 2.0, the broad vision was kept close. ¶ “Everyone that needed to be in the know has been in the know,” said MOSH board chair Parvez Ahmed. “Maybe they didn’t know the details, but knew they were giving input to something significant and something significant would come out of that input.” ¶ What came out of the discussion was a simple fact: MOSH is at capacity, in every way it can be. ¶ Classes and groups are full. Any exhibit that could fit has been put on. Revenue had grown as far as it is able within the three-foot-thick concrete walls that house the museum, which was built in 1967. ¶ It was time to consider MOSH’s future. Three detailed studies were completed in the last few years, looking at whether MOSH needed to move to an entirely new location or refresh its current spot. Once the decision was made to remain on the southbank of the St. Johns River, the master plan was built around it. 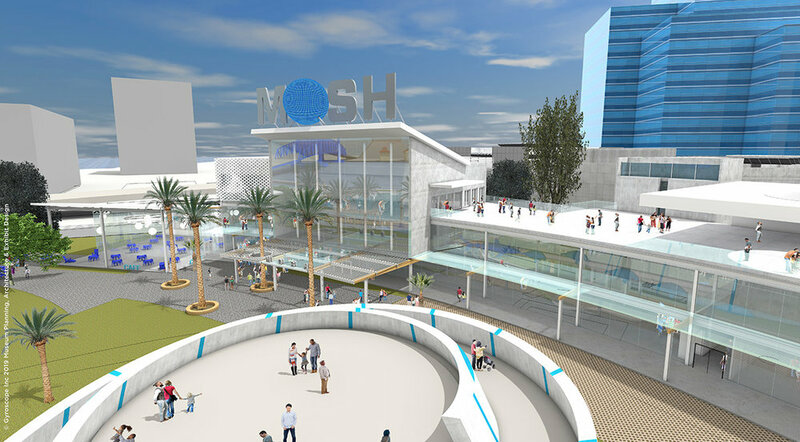 The new MOSH will flip its face toward the river, embracing the park and Friendship Fountain, which the city of Jacksonville has already set aside millions to renovate. The museum, with a modernized glass facade, will swell from 77,000 square feet to a mammoth 120,000 square feet. The plan will quadruple its impact on the park, said MOSH president Maria Hane. As well as the benefits to the museum, leaders of the plan hope for a broader effect, with the development becomes part of the larger vision for making downtown Jacksonville both a tourism destination and more desirable to businesses. "Yes, this is critical to downtown development," Hane said, "but, oh, my God, Jacksonville deserves this. It really does redefine us as a regional destination. This isn't just about the museum." The “MOSH 2.0” plan was revealed to the public on March 15. The proposed changes are projected to double the number of people the museum can serve annually, from 229,239 people in 2017 to about 468,000 by 2023. These investments are meant to position the institution as a regional draw and public gathering space for "lifelong learning and experiential education," according to a release. The project will cost between $80 million and $90 million, with about $20 million to $25 million to be raised from private contributions. Ahmed said that asks are already out for about $14 million of that number. Once the $20 million is gathered, MOSH will turn to city, state and federal funding streams. Funding could come from a handful of places, including the city of Jacksonville’s cultural services grants, the National Science Foundation and the Institute of Museum and Library Services. The hope is to have the museum expansion and renovation complete by 2023. Some of the work has already begun. The museum quietly launched a capital campaign called "MOSH 2.0: Expanding the Capacity to Inspire Innovation" in January, and in February added public Wi-Fi to its campus. A year ago, MOSH leaders traveled to several high-profile museums around the country to gather more data. Hane said MOSH wants to have dedicated spaces for its three core identities – cultural, natural and innovative ecosystems – but that each exhibit would be more blended together to give it a cohesive feel. In the new museum, the cafe and gift shop will have separate entrances open to the park, Hane said. The first floor will have a dedicated school group space and children’s museum section with a space for STEM learning for children under 5 years old. A large-scale model of the St. Johns River on the first floor with stations dedicated to water quality will act as a river-themed makerspace for the natural section, she explained. The second floor will focus on culture and innovation. The space for temporary exhibits will expand from about 4,500 square feet to 10,000 square feet, allowing MOSH to look at traveling exhibitions like “BODIES” that it simply couldn't consider before. A brand-new planetarium and courtyard complete the space. On the third floor, a conference area with a 200 to 400 person capacity will be available for rent, as will a green rooftop event space. ELM architecture firm has been contracted for the project, along with Gyroscope and GAI to develop the schematic design and the first phase of construction. "This becomes a very nimble space," Hane said. "This entire plan is designed to be very dynamic, so you can have a unique experience every time you come in. Before this. we kind of stayed a chapter-by-chapter gallery experience." One thing that isn’t changing is parking, she said. MOSH has a total of 130 parking spaces available for on-site parking. There are also 252 public parking spaces under the Acosta bridge, within one block of the museum. Once all the updates are completed, MOSH’s average revenue could double to $6 million annually, Hane said. In the past, MOSH’s focus on local history was limited by space. Hane and Ahmed said that the new museum’s expanded space will allow for more focus on the parts of Jacksonville’s history that often have not been given much space: civil rights history, African American history, early Native American history and immigrant narratives. While existing exhibits focus on parts of Jacksonville’s history, the museum has not been able to tell the story in the “multicultural, multigenerational way we wanted,” Ahmed said. In some ways, misconceptions about museum exhibits in general stood as obstacles. Updating the way exhibit stories are told is part of the process to making sure they resonate with audiences. Along with creating new jobs, MOSH 2.0 could become a critical part of downtown development and activation, Hane said. The museum’s STEM programs help prepare the workers of the future. The museum’s amenities act as an attraction for companies looking to recruit or to move to Jacksonville, and its STEM programs for children are enticing to families, too. Changing MOSH means more than just changing the building, though. The current museum has a “nostalgia” about it, Hane said, but the modern museum visitor wants digital technology; they want virtual reality experiences and interactivity. That’s the framework the museum will lean toward, with the makerspace concept at the heart of it. In one word, Hane describes the museum’s plan as “transformational.” For the city, for the community and for the museum. The emphasis on makerspaces and the Maker Faire will become even more prominent, he said, and serve as an anchor point in the new museum. The vision of MOSH 2.0 is to create a place where visitors can learn about the most cutting-edge science and the most far-reaching history. It will be a place to interact with the community and take in Jacksonville’s cultural and natural roots. While the planning for MOSH 2.0 might have flown under the radar, if the plan succeeds, the museum’s reputation will be far from a secret.